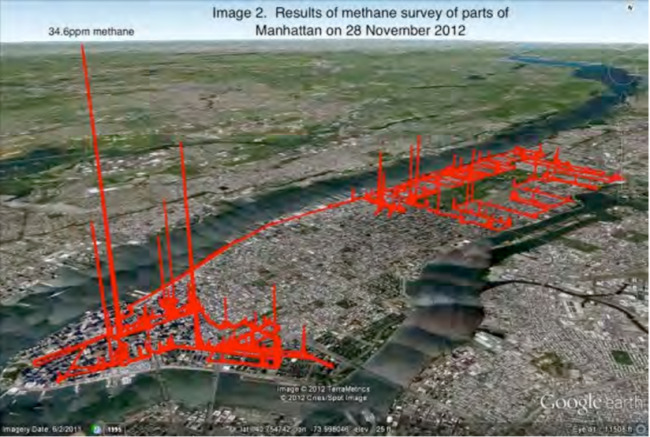 Methane has been on the minds of Manhattanites long before this week's tragic events in Harlem. Leaks of the gas have been blamed for a devastating explosion that killed at least seven people, but it's not a problem that has come out of the the blue. In fact, it was almost exactly a year ago that a street-level survey, funded by concerned citizens, showed the New York borough's streets to be a veritable sieve of leaking methane. And just this week, a separate report into the crumbling infrastructure of New York City recommended that the local gas utility - Con Edison - needed to accelerate the pace at which it replaces the city's ancient pipelines. It estimated that nearly 2/3 of the city's 6,300 miles of gas pipeline is made of the unprotected steel or cast iron that's vulnerable to leaking. It needs replacing, but it won't be cheap. At a cost of up to $8 million per mile to replace, a super-sized $30 billion upgrade bill staring the utility in the face. Up until Wednesday's explosion, which levelled two Harlem apartment blocks, Con Edison had been able to get away with just 30 miles of pipeline replacement a year. Pressure to quicken that slow pace will undoubtedly grow. But beyond the immediate tragedy unfolding from neglected gas mains, there's a more insipid threat slowly hissing from beneath the ground. And it's a threat that extends well beyond Manhattan's crowded jumble of underground pipes, one that's clouding the future of the gas industry at a time of climate change. The natural gas which flows into the city's gas network of leaky pipes is made up primarily of methane. It's an energy source that's widely seen as 'clean', credited with displacing 'dirty' coal, and cutting US CO2 emissions. The problem is that, while methane burns cleaner than coal on many fronts - including a reduced amount of CO2 per unit of energy when combusted - it is a powerful greenhouse gas in itself. When released unburned, methane warms the atmosphere 86 times more than CO2, over a 20-year timeframe. That means natural gas is only 'clean for the climate' so long as the leaks, from the fracker's wells to the home gas-boiler, are kept to a minimum ----- much less than 2-3% leakage in total. What last year's Manhattan report showed was that methane losses, for this part of America at least, were significantly higher ----- at over 5%. Other more recent reports have reinforced its conclusion that previous estimates of methane's leaky ways were also low-balled. It all suggests that the role of natural gas as 'climate saviour' is possibly undeserved. If there's one silver lining in the devastation wreaked in Harlem, then, it's that finally Manhattan's - and other US city's - 'leaky sieve' problem may be taken in hand. And that could even help to nudge the whole gas system away from its wasteful, climate-threatening ways. The problem is that it will cost. Costs that will eat into profits, and take away market share. Will the gas industry really just quietly foot the bill?